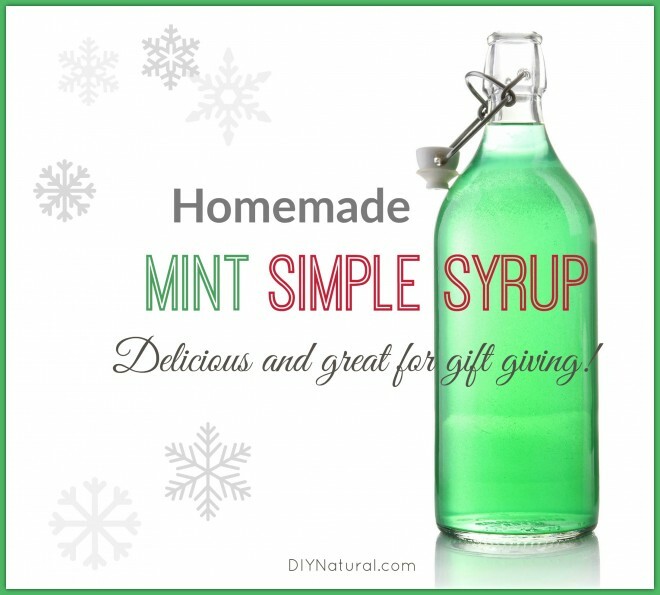 This mint simple syrup is perfect for the holidays! It seems that America’s love affair with the peppermint flavor at Christmas began with the candy cane. This week, as I sat planning recipes for homemade gifts my thoughts turned to the patch of peppermint still out in the garden begging to be used. In my recipe box are oodles of recipes calling for peppermint. I began to wonder why peppermint has become such a strong reminder of Christmas time. How did peppermint become popular at Christmas time? Truthfully, there is no definitive story. Peppermint wasn’t present at some historical Christmas event. In fact, it is a relatively new part of our festivities and no one really knows why. If you search Christmas history, the best you can do is a lot of speculation that we started our love affair with peppermint because of the candy cane. The first recipe using peppermint in Christmas candy is from 1844 and the first time it showed up in a published Christmas story was 1874. The candy cane is everywhere these days, but I began to wonder about where the peppermint pig fit in. The story of the Saratoga peppermint pig tells us that that tradition didn’t start until the 1880’s. That means the cane came before the pig. We can only speculate about whether or not the pink, hard candy pig was inspired by the cane. The taste of peppermint invades our store shelves at this time of year. There is a “habit” of having the flavor in our holiday celebrations, but there is no cultural background. I’m still left with wondering why, but perhaps the peppermint plant has just found an ingenius way to capture our imagination and ensure its survival. The peppermint plant (Mentha x piperita) has invaded most parts of the world. It is one of those curious plants that does not reproduce itself by seeds – instead, an identical peppermint can only be made by taking a cutting from the parent plant. Plant a “mint” seed and you’ll get something minty, but quite possibly not in the way you expected. Seeding the Mentha family produces new and wonderful variation, much like the apple tree. So, here I am with only weeks until Christmas and I still have fresh mint leaves to work with. I could make homemade creme de menthe or an invigorating salt scrub for feet. Instead, I believe I’ll make a big batch of peppermint syrup. Peppermint syrup can be used over pancakes on Christmas morning or it could be used to make cocktails on Christmas Eve. I’ll package my syrup up with a pretty label tied to the narrow top and let people get creative with what we know to be one of the most important flavors of the season! Place the leaves in a thick-bottomed sauce pan. Add enough boiling water to cover the leaves. Put the lid on the pot. Strain through a jelly bag or fine mesh strainer. Be sure to carefully squeeze all the liquid out of the leaves. For each cup of liquid you have, add 1 cup of sugar. Bring to a boil and simmer about 15-20 minutes, or when you get to a thickness that you like. Bottle, label, and date. This must be kept in the refrigerator and will last about a month. Syrup can also be frozen if you like. Can this technique be used for ginger syrup, too?